Hot off the silkscreen press. 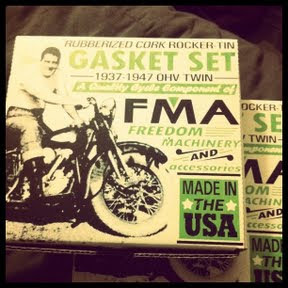 New packaging for our "knucklehead rocker box tins" gasket set. Stickers are easy and paying for it is cheaper but we like to give you the best product we can that's why we hand print our packaging ourselves. These gaskets are made of rubberized cork and were designed to stop the leaks that are most prevalent in the knucklehead motor. And guess what ? Alonzo's idea was a good one because They work. Otherwise we wouldn't be selling them. Your knucklehead deserves it.